Gracefully curving the South China Sea, tipping the Gulf of Thailand, Vietnam is an untouched jewel of Southeast Asia. Its resilient character and vibrant charm has seen it recently flourish into a tourist destination. Popular attractions include the War Remnants Museum in Ho Chi Minh City, Marble Mountain in Da Nang and Hanoi’s historic, old French Quarter. 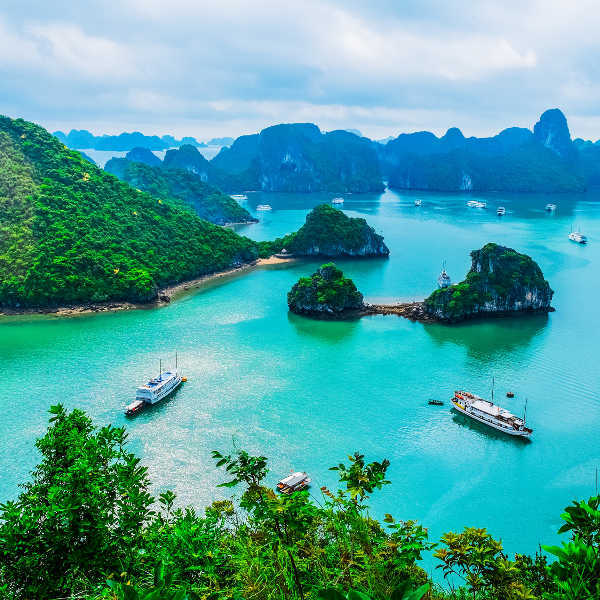 Prepare to rouse your senses and embark on a cultural discovery like no other because cheap flights to Vietnam are now available! Vietnam’s hub airport is Tan Son Nhat International Airport (SGN), a 20-minute drive from the centre of Ho Chi Minh City. The capital city of Hanoi is home to Vietnam’s second-busiest airport, Noi Bai. SGN serves a multitude of airlines, including Singapore Airlines, Emirates and Cathay Pacific. Popular connecting flights to HCM depart from Cape Town and Johannesburg. Experience a primitive world of simplicity, charm and character, where wizened ladies amble past you on bicycles overflowing with fruit and flowers. From ancient customs to modern high-rises, Vietnam merges old with new. Always expect the unexpected! The unrivalled landscapes of the sprawling, green rice paddies are magical in their design and elegance. Sail through the palm-frond labyrinths in the Mekong Delta, while the turquoise waters of Ha Long Bay are simply picture-perfect. This resilient country proudly displays its ruins and landmarks, sketching a history of empires, wars and triumphs. Monuments like the My Son ruins, Imperial Citadel and DMZ attest to the fortitude and humility of the Vietnamese people. Vietnam has such a complex weather structure, it is impossible to narrow down one particular season as the ideal time to visit. Northern Vietnam experiences two varied weather patterns, consisting of hot, humid summers and frosty cold winters. The best times to experience the north are in spring (March-May) and autumn (September-November) when the air is less stifling and the summer rains are at bay. Summertime (June-August) is uncomfortably hot and humid, and travel around this time is not recommended. Summer is also monsoon season and heavy downpours in low-lying areas often result in significant flooding. If you plan on visiting the picturesque rice fields in Sapa, the paddies are lusciously green during spring. The central coast experiences a somewhat different climate. Nha Trang sees the onset of the wet season in November, while in Hue and Da Nang, the rainy season occurs between September and February. While summers are relatively hot, you’ll be able to cool off at the beautiful beaches and go scuba diving off Cham Island in Hoi An! Southern Vietnam has a more consistent climate. The summer rains fall between May and November, while the dry winter season runs from December to April. Be aware that the Mekong Delta often floods during monsoon season, making outdoor tours and transport rather tricky. Take note of the Lunar New Year (Têt) around February when throngs of locals flock to the south and accommodation prices surge. Vietnam is a mysterious gem, brimming with history, culture, simplicity and unrivalled scenery at every turn. 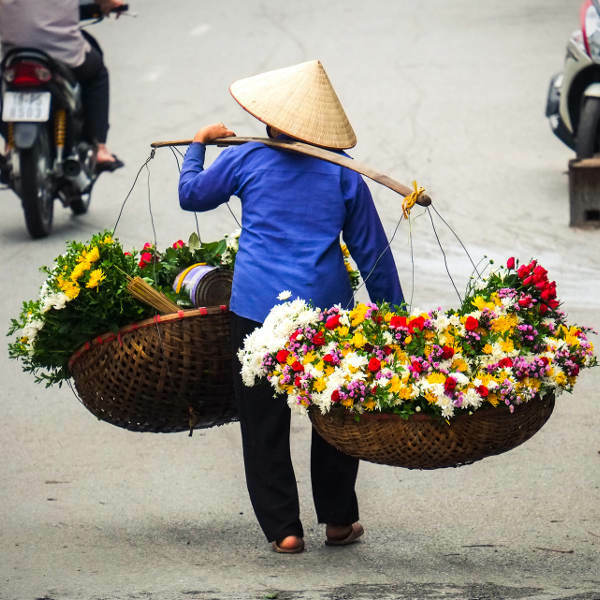 Your experience of Vietnam greatly depends on how you choose to explore it. Pre-arranged tours with 5-star accommodation make for a leisurely experience. However, for a richly rewarding discovery of how the locals live, be prepared to check your expectations at the door. Northern Vietnam is vastly different from the south in the way of its French influences, communist remnants and unapologetic coarseness. While it’s a little rough around the edges, the capital city of Hanoi has an old-school charm that is hard to dismiss. Its intricate alleyways snake their way through the city, revealing sights and sounds of the local way of life. For a sensory trip of the surrounding landscapes, be sure to visit Ha Giang, Mai Chau, the emerald rice fields of Sapa and the limestone cliffs of Ha Long Bay. To veer off the beaten track, the Central Highlands offers adventurous trekking, gushing waterfalls and ethnic minority villages with lush plantations of coffee, tea and silk. 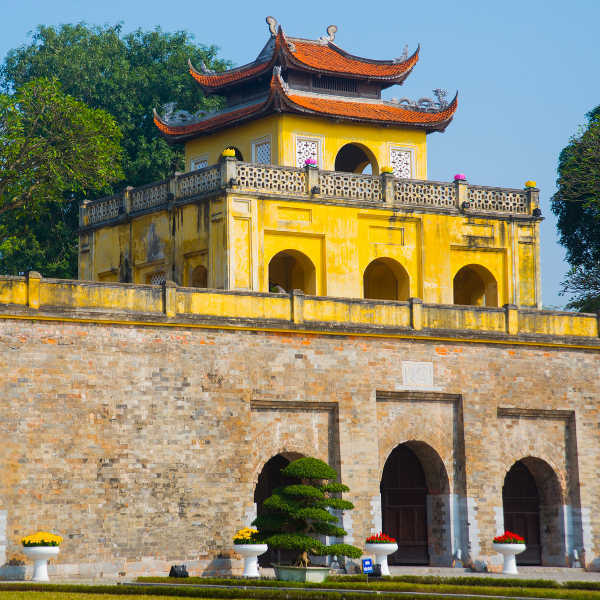 For history buffs, the imperial city of Hue is a must-see, while a little further north the DMZ paints a stark picture of the Vietnam War. Da Nang is a resort paradise with its beautiful beaches and romantic town of Hoi An. Southern Vietnam offers up cosmopolitan flair in the way of Ho Chi Minh City, a thriving metropolis of commerce and entertainment. The orchards and rice paddies of the Mekong Delta are breathtaking; further ashore Phu Quoc Island welcomes visitors to its palm-fringed beaches. Compare several airlines, and book your cheap flights to Vietnam online at Travelstart! Please note that Immigration Offices frequently change visa requirements, so ensure you are up-to-date with the latest policies. See the consular services website for more information. Regarding personal safety, Vietnam is extremely safe. Locals are generally courteous and friendly towards foreigners, despite language barriers. Feel free to walk around the city streets, exploring the attractions and local gems tucked away in discreet alleyways. The rule of thumb is to always bargain down prices at the markets by at least a third of the asking price. If you get hassled by peddlers, firmly say ‘No’ and walk away. Maintain a general sense of awareness, especially in crowded areas where pick-pockets and scammers are on the prowl for unsuspecting tourists. Traffic in Vietnam is hazardous and overwhelming, so try to stick with locals when crossing the road. If you decide to rent a scooter (advisable only if you have prior experience), always wear a helmet and drive cautiously. No vaccinations are required to enter Vietnam; however, it is highly recommended to be immunized against typhoid and hepatitis A as you may be exposed to contaminated food and water. Tap water is unsafe to drink – bottled water is cheaply available everywhere. Pharmacies in major cities are well-stocked and international clinics and hospitals are available. If you are travelling to rural areas and islands, bring your own medication as well as a first-aid kit with basic supplies. A comprehensive travel insurance is strongly recommended, in the event of unforeseeable theft and medical expenses.